end of Vashon, with the entrance between Neill Point on Vashon and Piner Point on Maury Island. It’s a nearly five-mile-long inlet, about a half-mile wide, that extends about 3-1/2 miles north between the islands. It then turns east into the bay at Dockton, swings north around Burton Peninsula, past Portage and turns west, ending in the “inner harbor” at Burton. A rocky shoal off Manzanita on Maury is marked by red nun buoy “2.” Legend has it that the rock was known to early Native Americans as “Killer Whale’s Mother.” The whales still play around this rock even today. 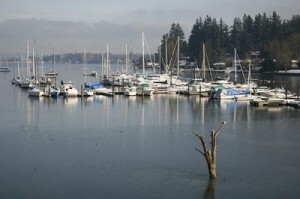 Vashon and Maury are joined by a sandy neck of land at Portage. This low isthmus was once a tombolo much lower than it is now, where Native Americans portaged their canoes from Quartermaster to Tramp Harbor on the east shore, and it is also a sacred place. Evergreens line the shores andclimb the hills above Quartermaster Harbor, with heights rising to over 400 feet on both islands. There are good anchorages as well as several places to moor in the north end of the harbor. Quartermaster – Name given to the first post office established on the harbor in 1890.